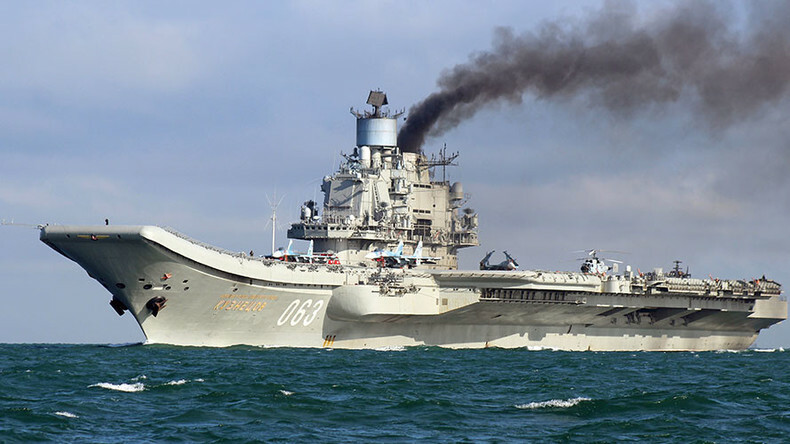 The Russian naval group in the Mediterranean, headed by the Admiral Kuznetsov aircraft carrier, is preparing an offensive against militants on the outskirts of Aleppo, Syria, according to reports citing a source in the Defense Ministry. Jets from the Admiral Kuznetsov, the Peter the Great battle cruiser and other military ships in the battle group equipped with precision weapons will take part in the operation, Interfax and Gazeta.ru reported on Tuesday, citing a source in Russia’s Defense Ministry. The strikes will be launched "in the nearest hours" and will target the distant outskirts of Aleppo, the source said, adding that there are no civilian-populated areas nearby. The reported operation is aimed at preventing more militants from entering the city, which has become a terrorist stronghold in Syria, Interfax quoted its source as saying. The most advanced weapons, including Caliber cruise missiles, might be used, Gazeta.ru reported. The missiles will probably be launched from Russian submarines that could also be in the area, it added. Ahead of the battle group’s arrival into the waters close to Syria, Russia increased its reconnaissance in the region, the source said. Drones and radio intelligence, as well as data gathering from satellites have reportedly been intensified, allowing the exact locations of the terrorists to be determined, as well as their planned routes to break into Aleppo. The Russian and Syrian Air Forces have not launched airstrikes on militants in and near Aleppo since October 18. Terrorists have used the humanitarian pause to try to fortify their positions and strengthen their presence in northern Syria, Russian military officials have warned.